World acclaimed lager beer. Awarded championship gold medals in London, Geneva and Paris. This beer as been the source of some dispute in the office. Several work collages of mine were traveling to Singapore and had this beer while there. Some really liked it (Gene, Andy) and some (Ray) claimed it tasted like fish oil. 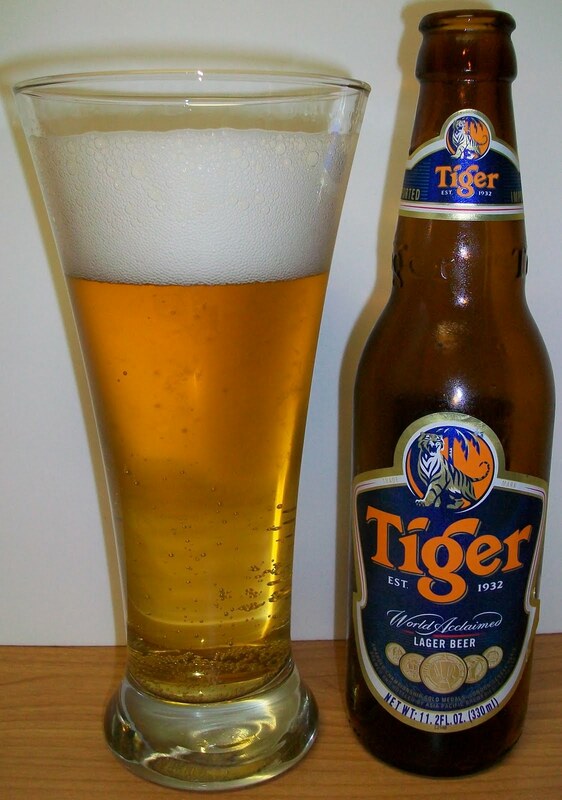 So low and behold on my office desk a couple days ago was a bottle of Tiger. I assume my job is to settle this dispute on the World Acclaimed Tiger. So here we go. The beer pours a clear pale straw with a bright white head. The head initially appeared that it would diminish to nothing in a short time but it really just reduced to a nice protective layer and looks like it may leave some lacing. At least this did not vanish like most American Adjunct Lagers. Like most Adjuncts there is not much on the nose of this beer. There are some light pilsner type malts and very light floral hop notes on the nose of this beer. Wow, what a surprise. This is a clean crisp and refreshing lager. It really does have all the qualities of a good pilsner lager. There will not be much of a play by play but let me try to explain this experience. It starts out with a very light sweetness up front on the tip of the tongue, then the most pleasant and refreshing effervescence over the tongue in mid-sip. The back end is extremely easy drinking; the swallow is effortless. The finish is crisp and clean with just enough hops to provide a dry bite but nothing lingering or bitter. Like most adjuncts there is not much of a lingering aftertaste. There is an almost German-Like pilsner quality to this beer. I am not just surprised; I am astonished at how much I like this beer. I really was expecting a Budweiser tasting beer. We started this one somewhere around 45 degrees. We are now at 57 degrees and this is just as refreshing as it was at 45. This beer is not picking up anything off tasting as it warms. It’s interesting that this taste more like a German Pilsner than an American Adjunct Lager. I always rate beers according to their individual style or category. That being said I normally do not rate American Adjuncts. I really have a hard time giving one of these beers a rating of an A or B in class when overall they are not very drinkable. However this is one that could change my thinking about rating these beers. OK, back to the review. As this beer warms there is a more noticeable earthy aspect to it. It’s actually quite good; more like a German Pilsner than an Adjunct Lager. I know, I’m repeating my self. I was actually prepared to take bribes from Gene and Andy in order to give this a favorable review but that will not be necessary. I really did enjoy this beer. Well, as much as you can enjoy and American Adjunct Lager. I’m not going to rate this but I can say that this may be the best Adjunct lager that I have ever had. I just hope the headache was worth it. So many thanks to Gene, Andy and Ray for all the office entertainment around this beer. I cannot say that this is a good beer but I can say that it is a good Adjunct Lager, for what it’s worth. If you like American Adjuncts like Bud, Miller, Coors etc you will love this beer. It really does have some nice lager flavors to it.